Today a new VMware fling has been released, and it’s fantastic! By now I am sure you have probably heard all the buzz from VMworld and with the 5.5 release and announced betas. Two of the most talked about technologies are vSphere Flash Read Cache (vFRC) released in the new vSphere 5.5 version and also VSAN which was announced as a beta. Today a new VMware fling was added to the site called “PowerCLI Extensions” here which allows you to use both VSAN and vFRC from PowerCLI, this gives you the added cmdlets needed in your PowerCLI session to automate two of the latest and greatest features from VMware. 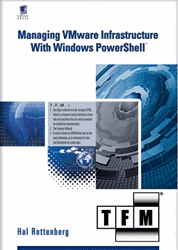 This entry was posted in Extensions and tagged PowerCLI, VMware on November 3, 2013 by Alan Renouf.